Equi-Heart Pledge: Finding Gratitude: How to Manifest an "I Love My Life" Life! Finding Gratitude: How to Manifest an "I Love My Life" Life! As we flow through the holiday season of gratitude, what if you aren’t feeling very grateful?! What if your life, your dreams, your equine business aren’t panning out quite the way you hoped? The horses have a profound tip for you in this week’s story! 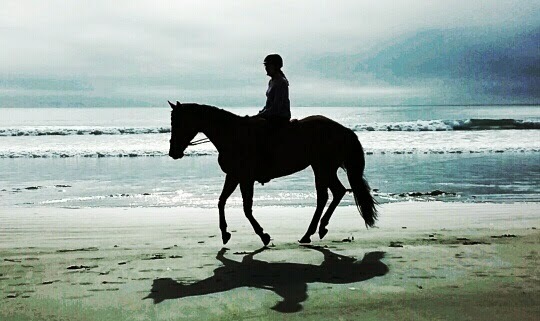 As many of you know, my two absolute loves are the ocean and horses. 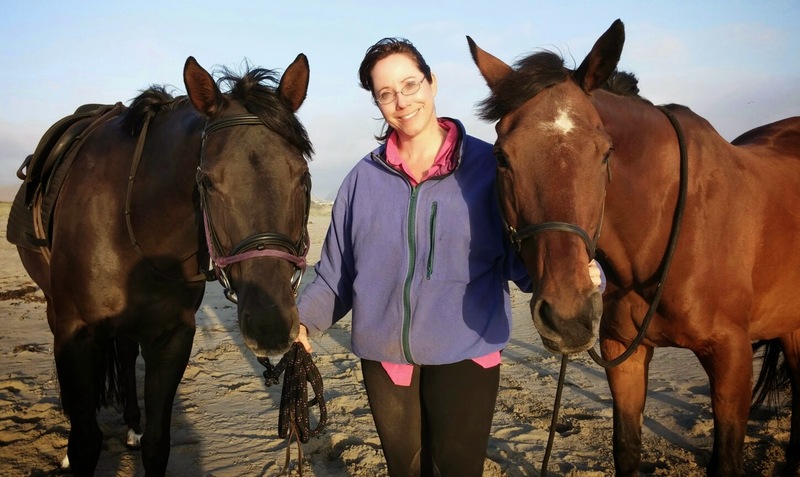 Thus, I was SO grateful to live my dream and spend a month on the beach with two of my horses this summer. To me it was pure & perfect HEAVEN. But after the paradise of beach riding, back at home in Colorado, I’ll be honest, it was hard to be happy. Suddenly, everything I DIDN’T like about Colorado was in my face. Suddenly, all of the reasons I wanted to live on the ocean, were very, very clear. And it made feeling happy very difficult for a while. Yes, I actually moped around, feeling lost, feeling frustrated, and feeling a deep longing to be somewhere else. I actually grieved. Then I went on a shamanic journey with the horses! If you haven’t explored this process for accessing inner wisdom, I highly recommend it- anyone can learn. 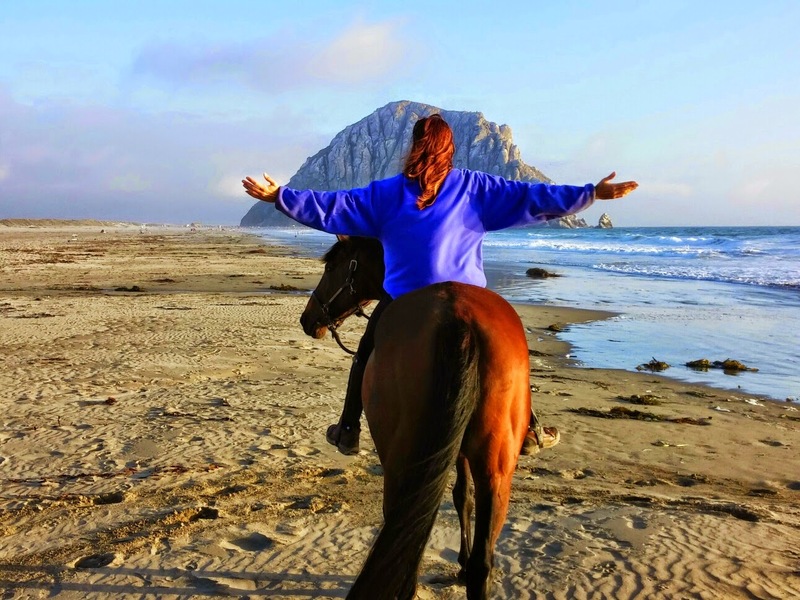 Being committed to somehow finding my way BACK to the ocean, my focus for this shamanic journey was this question: What do I need to know about how to manifest a healing horse ranch by the sea? 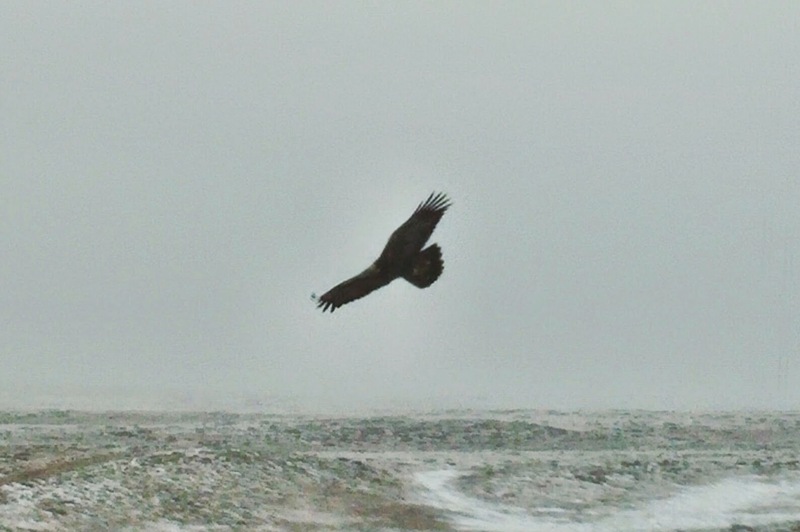 As I stilled my mind with the drum beat and the journey began, a big, bold, and beautiful Golden Eagle flew in to be my guide. She took me to a gorgeous piece of paradise over-looking the Pacific ocean. There I was met by a clan of horses, who surrounded me as I gazed out over the peaceful sea, giving me the feeling of Infinite Possibility. A REAL Golden Eagle visited me in CO shortly after my journey! Then calmly, one powerful White Mare stepped out from the herd and approached me, asking me to notice how I felt as I stood upon this land. I felt that feeling course through me, the feeling of being in AWE of getting to live on this beautiful land, of feeling GRATEFUL that I got to ride on the beach often, of feeling THANKFUL to be surrounded by all of my horse friends AND the ocean. I let those feelings swim through every cell of my system and it felt delicious. The journey soon ended, but that feeling of loving my life was still so juicy & alive that I decided that YES, indeed, I will take the time to imagine myself living by the ocean with my horses. Quite frankly, I was willing to do this every single night before bed, because I wanted more than anything to be able to move to the coast ASAP! But as I practiced this vision nightly, a strange thing happened. Without any effort at all, I started loving my life in Colorado. I started noticing the beauty in every single thing. I started appreciating my surroundings. I stated feeling grateful for my life here in many small and big ways. For a while, I even stopped longing to be somewhere else. Now, here’s the thing. I did not on purpose practice any of those things. Now, I thought this was quite funny, because in my imagination, I was LOVING a very different kind of life, one by the ocean! But no matter, my subconscious took it’s direction and started loving my life NOW, just the way it was. And guess what is so brilliant about this advice from the Horses? As long as I stay in a happy, peaceful, grateful space about my life NOW, that vibration will be in harmony with what I wish to create, and so, my dream WILL be able to move towards me and find ways to manifest. Because here’s the thing. As long as I, or you or your clients, stay unhappy about what IS, you can’t possibly create or attract something better. Your negativity will create resistance that will PUSH AWAY that which you wish to create. The resources & opportunities simply won’t be able to show up, because the door to your heart will be slammed shut. So how ironic is that! 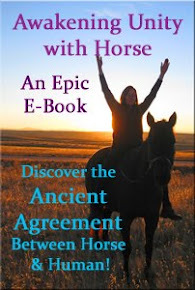 By getting me to say YES, to what I want, the horses invited me back into a juicy, open, positive feeling framework into which good things may come. Good things that could never come when I was moping around and pouting about being stuck in beautiful Colorado! And so, during this time of holiday gratitude, the horses want to ask you to embrace a similar notion. ~ What would LOVING YOUR LIFE, feel like in your body??? Indeed, what miracles could we manifest with the horses if we ALL imagined a world where we LOVED LIFE? I can feel the power of that now! Please join me and the herd this season in manifesting more Love of Life, so we may all flourish into the New Year! 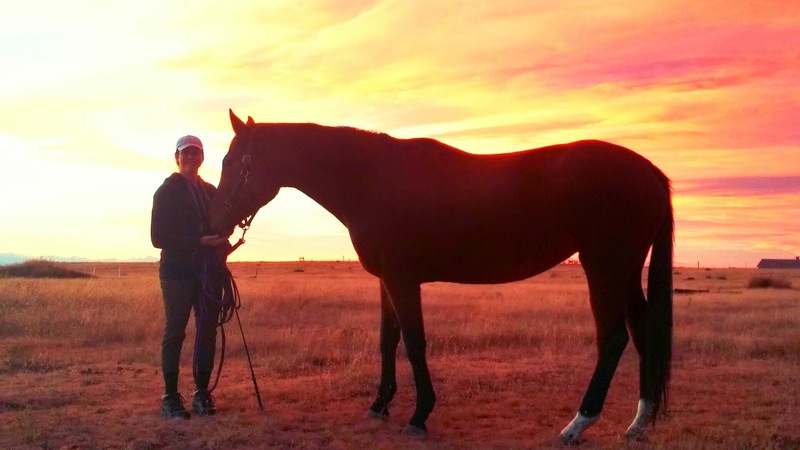 Dr. Jenn and her first horse, Seren, as they live her dream! 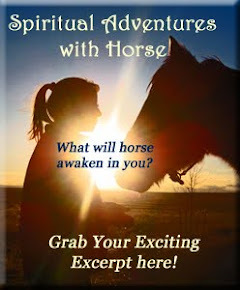 How have the horses helped you to find and feel GRATITUDE so you could manifest more of your vision into your life???? Please share in the comments below.